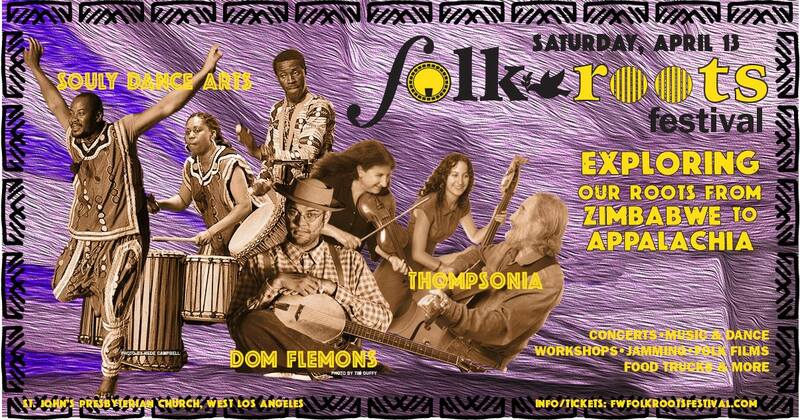 Folk Roots Festival in Los Angeles! We are pleased to announce that Sausage Grinder will be performing alongside Dom Flemons, Thompsonia, Spencer & Rains and many others at the Folkworks’ Folk Roots Festival! Sausage Grinder’s David Bragger and Chris Berry will also be teaching workshops! CLICK TO GET YOUR EARLY BIRD TICKETS NOW! $10-$20 sliding scale entry fee. The Tiki Parlour is proud to announce a fiddle workshop/potluck/jam with one of the premier voices in the traditional Métis fiddling of Montana. Only 15 seats available for this workshop, so RSVP immediately. 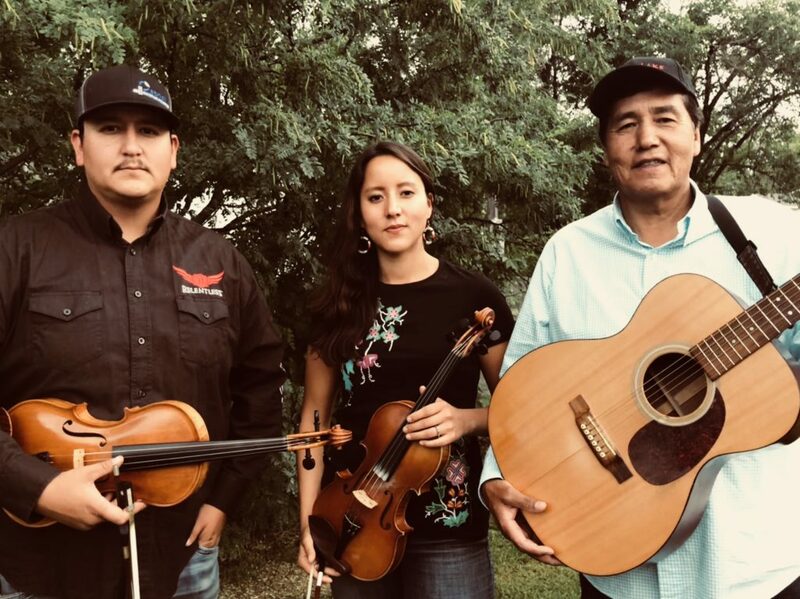 This workshop will explore the Métis (Native American) fiddle styles of North America, particularly of Montana. We will cover tunes that are “crooked” (free-metered) reels and will focus on the Métis duck dances (tuning the fiddle AEAC# and these particular tunes work great for playing for square dances). We will learn traditional tunes, working on bowing, ornamentation that makes the Métis rhythm unique. All tunes will be taught by ear. Students are encouraged to bring a recording device. Jamie Fox is a Métis fiddler of the Aaniih and Nakoda tribes. 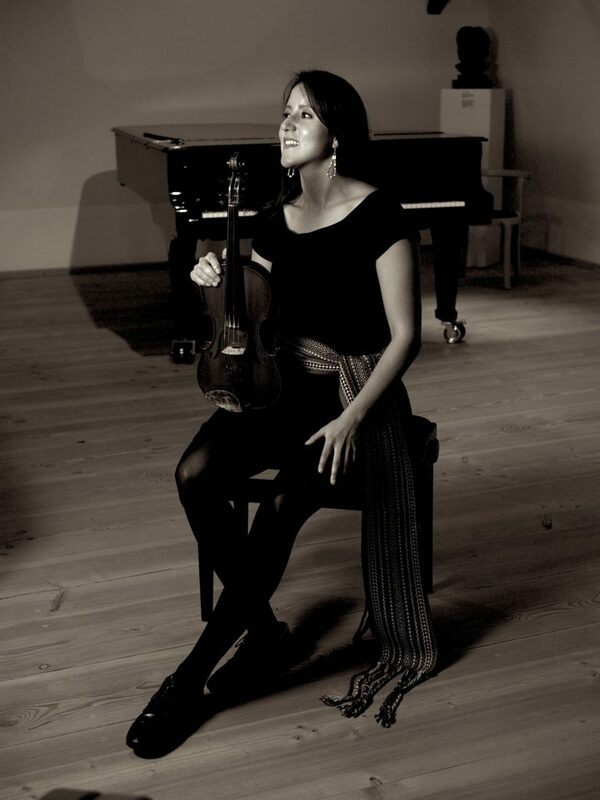 She grew up on the Fort Belknap Reservation of Northern Montana where she was immersed in a lively fiddle and dance tradition in the community. The tunes and dancing played there derive from a mixture of Celtic, French, and Native American cultures – local Saturday night dances were a positive bridge in the racial divide of what it meant to grow up on the reservation and be mixed blood. Potluck Lunch: Noon on Sunday, January 13th. Celtic, French, and Native American cultures. experience with elder Métis fiddlers is exceptional and singular. mixing in the upper reaches of the North American continent. Banjo & Fiddle Workshop NEWS for the Pozo Old-Time Gathering on Saturday Nov. 10th! Fiddle and Banjo Workshops! On Saturday, November 10th David Bragger will be teaching an Old-Time Fiddle Workshop with Susan Platz! 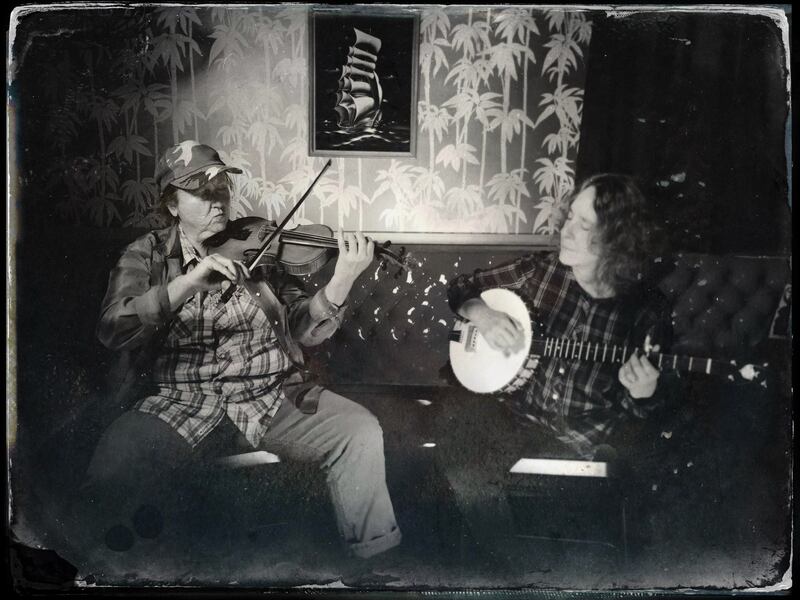 They’ll teach an old-time fiddle tune from their critically acclaimed CD “King’s Lament–Old-Time Fiddle Duets.” They will also teach rhythmic fiddle seconding and the tune’s harmony part with all Bowing clearly explained! The fiddle workshop is at 2:00 and it’s only $25! David will also be teaching a “Rare & Crooked Tunes” Banjo Workshop at 3:30! The banjo workshop will focus on rare and crooked tunes from David’s repertoire, including a rare southern gem from his upcoming album with Rafe Stefanini. 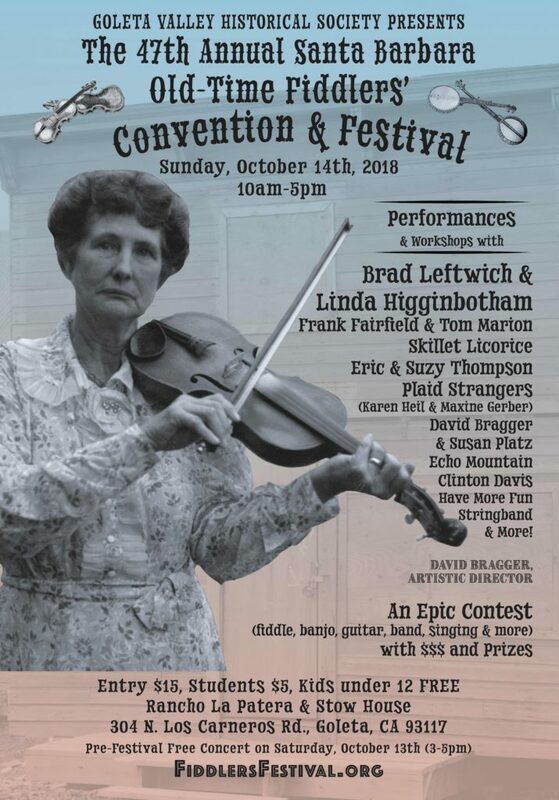 For lovers of traditional music, something wonderful is on the horizon: The Santa Barbara Old-Time Fiddlers’ Convention & Festival on Sunday, October 14th and the official pre-festival concert on Saturday, October 13th. This is my third year as the artistic director for one of my all-time favorite old-time festivals. Needless to say, I’m fired up to share the great events and performers with you. The Fiddlers’ Convention was founded 47 years ago by musician and folklorist Peter Feldmann who envisioned a festival dedicated to sharing traditional music with the community. Nearly five decades later, it is still going strong, attracting musicians and traditional music lovers from all around the country. It’s now hosted by the Goleta Valley Historical Society who strongly believe in preserving the history and living culture of old-time music. The festival will present performances and workshops with master musicians, hosted jam sessions, an instrument petting zoo, a raffle, folk art & music vendors, a pre-festival concert the day before and the “beating heart” of the festival itself: The Contest. This contest’s purpose is to expose our music to all the musicians (and non-musicians) who attend the festival. This contest doesn’t have an aggressive competitive vibe at all. Musicians of all levels, including beginners, are highly encouraged to sign up and show their peers (and judges) what they’re working on. It inspires so many people to see others play old tunes and songs of early America. Often spectators transform into musicians once they see how much fun the contestants are having. The categories include: fiddle, youth fiddle, banjo, guitar, mandolin, singing, youth singing, misc, instruments (dulcimer, autoharp, jaw harp, etc. ), band performance and best backup instrument. The contest now has early registration online to avoid the sign-up line at the festival, however you can still sign up at the festival. Contest Pre-Registration Here. On the Performance Stage, old-time legend Brad Leftwich will be performing in classic old-time duo form with rhythm powerhouse Linda Higginbotham. Brad’s fiddle and banjo playing has inspired scores of musicians from around the world. The talented and enigmatic old-time performer Frank Fairfield will be performing with guitar/mandolin/banjo legend Tom Marion. Frank Fairfield was recently featured in the American Epic documentary series and Tom Marion is known for his playing with Robert Crumb’s Cheap Suit Serenaders as well as several traditional jazz and string bands in Los Angeles. The Bay Area string band Skillet Licorice, who are masters of repertoire from the East Texas Serenaders and the Skillet Lickers, will be strutting their rags, waltzes and hoedowns too. 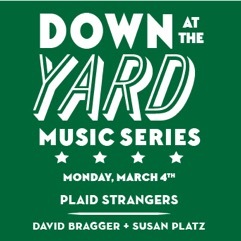 Two of my favorite award winning fiddle and banjo players Maxine Gerber and Karen Heil (of the Bucking Mules) will be performing as Plaid Strangers. Every lover of banjo/fiddle duets will be totally mesmerized. 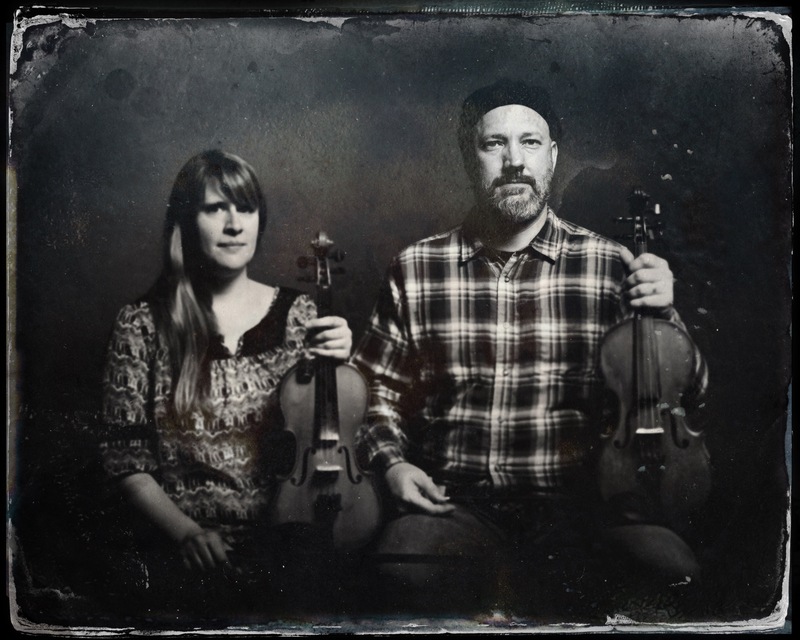 Also, Los Angeles’ Have More Fun Stringbandwill be kicking off the day with a set of high energy songs and fiddle tunes. For those who spend the weekend in the area, the festival now presents an Old-Time Concert on Saturday the 13th from 3PM-5PM to get things started. It’s Free. This year’s pre-festival concert will feature Los Angeles old-time band Echo Mountain who were a huge hit at last year’s festival as well as fiddle duets from David Bragger & Susan Platz and members of Sausage Grinder. 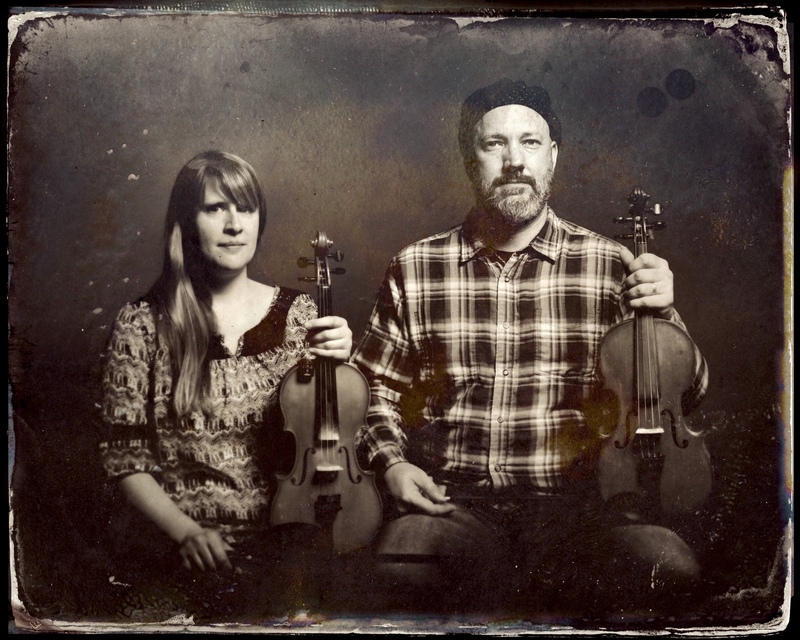 They’ll be performing several pieces from their latest release: King’s Lament: Old-Time Fiddle Duets, the first double fiddle CD in old-time music! Also, Kentucky-born old-time multi-instrumentalist Clinton Davis will be performing tunes and songs on guitar, banjo, harmonica and fiddle. 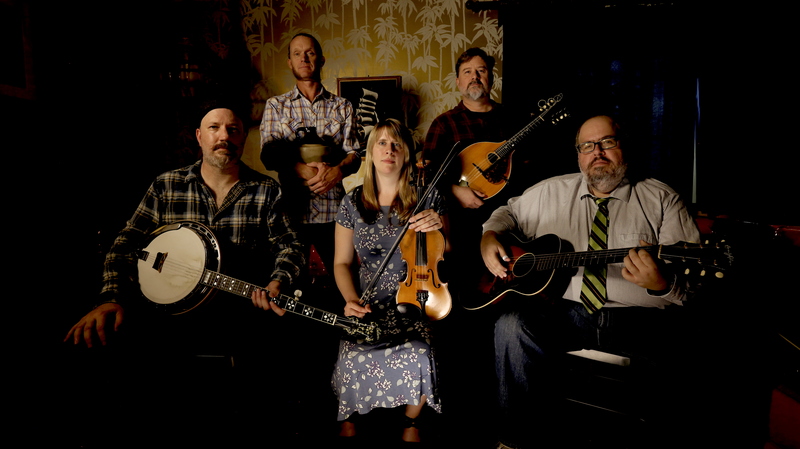 Clinton has recorded CDs with the G Burns Jug Band and is in great demand as a solo performer.